An IT giant was at one of our protection homes for boys to prepare breakfast for our children. 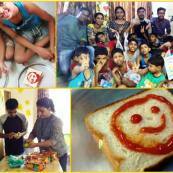 They celebrated #DaanUtsav by doing#sandwichseva for our younger lads. Thanks for bringing yummy smiles!